In a small enclosure just off the main road through Simonstown to Cape Point in South Africa, stands an outstanding statue of a dog, but this was no ordinary dog. He was a huge pedigree Great Dane with a long official name, bred in a Cape Town suburb and born on April the 1st. in 1937, although given this birthday, he was no April Fool! During the early part of WW2, he found his way to Simonstown, and the Naval Depot located there. He attached himself to the sailors, who became very fond of him. They would take him by train on their runs ashore to CapeTown, where, after having his usual two pints of beer he would then keep watch on his sailor mates, and round them up to catch the last train back to Simonstown and the Depot. When the train had arrived, he would go through the carriages to ensure that the sailors all woke up and got off, it being the end of the line. Officials from the South African Railways objected to his riding on their trains and christened him “Just Nuisance,” and threatened to have him impounded and then put down, if he continued to ride on the trains. There then followed such an out cry from the Navy, that the Commander-in-Chief intervened on behalf of “Nuisance,” he was granted the rate of Able Seaman, and taken on the books of HMS Africander. This wonderful dog died on his birthday in 1944, and his memorial was erected in 1985, the inscription at its base reads: “Just Nuisance A.B. 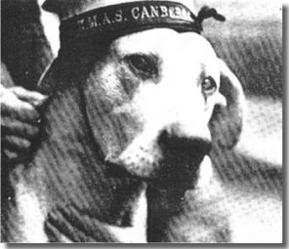 Loyal friend and companion of the sailors who called at this port during WW2. Remembered with affection.” At his feet lies his cap, with its HMS Africander tally. I recall seeing Nuisance on the train when I went off to CapeTown, and woe betide any civilian who went near one of the sleeping sailors making their return to Simonstown after a celebration in CapeTown. Before my ship, HMAS Australia, was finally leaving the dockyard at Simonstown, some of our crew members had somehow smuggled Nuisance on board, to hide him below decks. How they managed to get him past the Officer of Watch on the gangway, I do not know. Maybe he did a Nelson at that stage, and turned a blind eye at the crucial moment, because Nuisance was a huge animal. We had cleared False Bay, and just cast off our last tug, when Nuisance made his appearance on the upper deck. The Commander sighted him, and was furious, there was no way we could keep him on board with his Aussie mates. An improvised sling was hurriedly made, the tug recalled alongside, and Nuisance was unceremoniously hoisted over the side, and lowered into the tug for return to his Depot at Simonstown. The culprits were never found!